The Dunkin’ Donuts and Baskin-Robbins Community Foundation is proud to introduce its new name: the Joy in Childhood Foundation. Our mission is right there in the name: to provide the simple joys of childhood to sick and hungry kids. 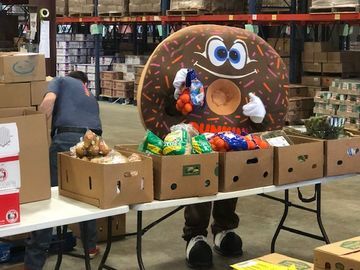 From partnering with local food banks to supporting children’s hospitals across the U.S., the Foundation has been bringing together franchisees, employees and their surrounding communities for ten years. With this rebranding, we are continuing our efforts while focusing on what’s truly at the heart of our brands and the Foundation: providing joy. This week, we are celebrating our new mission during our third annual Week of Joy (October 17-21), which you may remember as the Week of Service. We are teaming up with nearly 70 Feeding America® member food banks nationwide to host volunteer events to fight children’s hunger.We believe it is difficult for children to find joy when their lives are compromised by hunger or sickness. That’s why we have recommitted to serving sick and hungry kids by funding joyful environments, joyful experiences and joyful expressions. 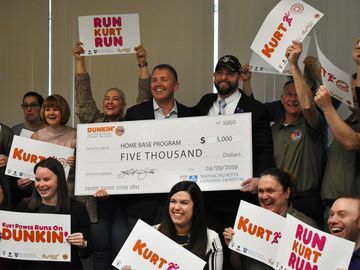 This year, we anticipate that over 1,500 Dunkin’ Donuts and Baskin-Robbins franchisees, crew members and corporate employees will volunteer upwards of 4,000 hours and provide hundreds of thousands of meals to kids and families in communities across the country. See here to learn more about our partnership with Feeding America®. 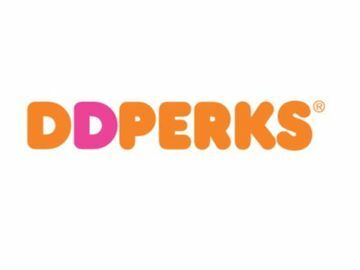 For more information about the Joy in Childhood Foundation, visit DunkinBrands.com/foundation. And be sure to check back as we continue to share more information on the Joy in Childhood Foundation, the Week of Joy and more in the coming weeks!